. Published on October 31, 2018 . The horror stories are out there. For people of color, and anyone else who identifies as minority of some sort—whether it be ethnic or gender based—the idea of deciding whether or not to go forth and apply to MFA programs may seem challenging, and at times, discouraging.The discussion of inclusion in MFA programs is one that is on-going. Within these discussions, several minority writers have discussed their MFA experiences to be alienating: many have described their writing as being “dismissed” by other members of their cohort, with questions of authenticity and correctness being involved. The discussion of inclusion in MFA programs is a topic of high debate among many members of the literary community, with opinions and commentaries seemingly scattered across the spectrum. For me, deciding on what schools to apply for was not easy, but Columbia College Chicago emerged as one of my top choices given the diversity of the English/Creative Writing’s graduate program faculty and staff—upon my own research. I did not feel the intense fear that others may have felt when matriculating to an MFA program, but still, the notion of potentially experiencing some sort of alienation during my time at Columbia hung around in the back of my mind during the first month and a half of my first semester—a time where I was still adjusting to graduate school. When I first received my acceptance letter from Columbia in the mail, I was ecstatic, but this idea of alienation still lingered. Shortly after receiving my acceptance from Columbia, I participated in the Voices of our Nations Arts Foundation (VONA/Voices) Poetry Residency Workshop that was held Berkeley, CA. 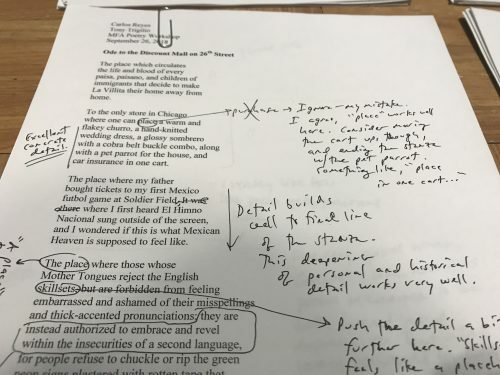 The experience I gained from my cohort and my mentor, Craig Santos Perez, during my residency in Berkeley helped me established my voice as poet, which I found is often Spanglish (with a bit more emphasis on the “English” side). 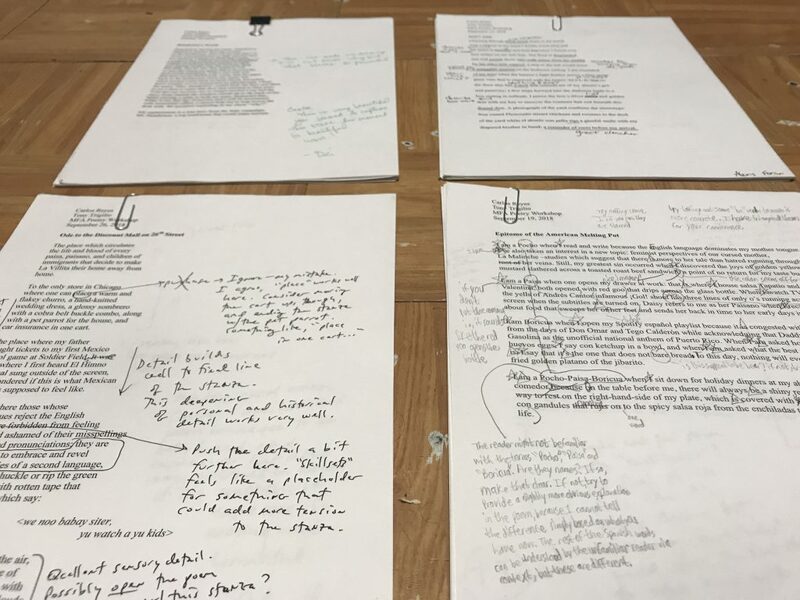 While it was exciting to have found what I consider to be “my voice,” I felt anxious about how my writing style would be received among my poetry cohort at Columbia. Midway through my first semester though, I can confidently say that I feel at ease: my cohort has been exceptional and extremely receptive of my writing. A critique of my poem from a fellow poet who had questions about the Spanish terms I used, but never discouraged me from using them. While some of my poems, especially one that have Spanish phrases that may not be uncommonly known, have comments that say something along “What is this?” or “Is this a name?”, these are natural responses that I assume most people have when they come across something unknown and foreign. Nevertheless, none of the comments have been discouraging, nor has the question of “authenticity” ever been addressed to me, or in any one else in my cohort for that matter (that I am aware of). My workshop experience thus far has not been anything less than constructive. 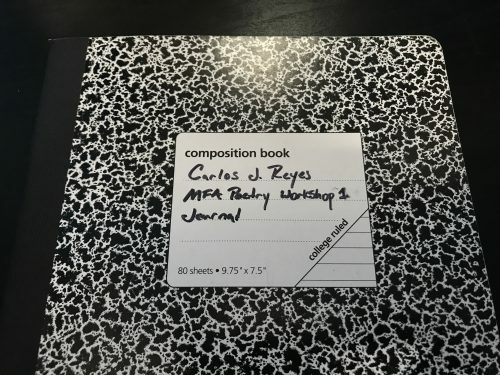 Many of the poets in my cohort have mentioned how they feel connected and are able to envision the sense of culture within my writing, despite most not identifying as Latinx. The workshop experience with my cohort has never been about “correctness” but rather an examination connected to purpose and intent. The feedback that I’ve received throughout this semester has helped me improve my writing in the way I originally imagined and hoped for. 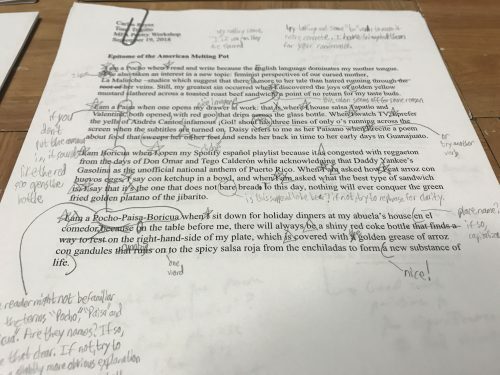 While much of my progress is due to the members of my cohort, the style in which our workshop Professor Tony Trigilio has laid out our workshop has helped as well, and is something I am grateful for. 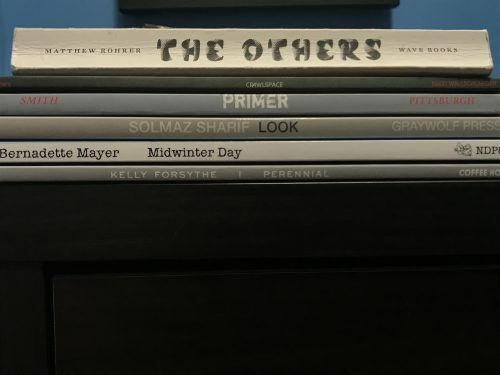 The poetry books Tony assigned for my cohort contain a great variety of different writing styles, written by various authors from different backgrounds, whether it be ethnical background, gender identity, etc. While graduate school is challenging, I can finally say that the fear of being alienated because of my Latinx identity, and the way I decided to portray that in my writing, has been released from my mind.